Choose from 5 venues, each unique and beautiful in its own way. 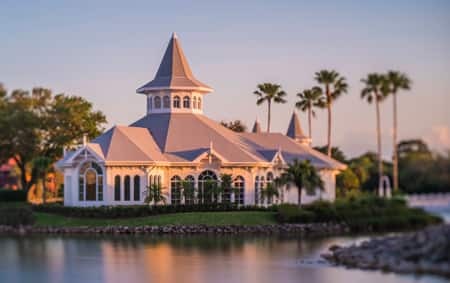 From the beauty and grandeur of Disney's Wedding Pavilion with a perfect view of Cinderella Castle to a timeless seaside resort, each Escape Collection venue is designed to inspire and delight you with its elegance and charm, setting the stage and helping to make your day everything you imagined. We've included all the special touches from floral, photography and transportation to a violinist, a Cake & Champagne Celebration and even an on-site Wedding Coordinator for the day of your ceremony. Easily our most popular wedding venue, this breathtaking Victorian chapel surrounded by a serene lagoon occupies its own private island, entered by footbridge. A view of Cinderella Castle provides an unforgettable fairy-tale backdrop. Say your vows in front of the cascading waterfalls of the Canadian Rockies, a strikingly majestic setting perfect for nature lovers. The rugged beauty of this venue is sure to make an everlasting impression on your guests. As if from a different era, the grand gazebo at Sea Breeze Point is a truly lovely open-air setting along the boardwalk, with magnificent views of Crescent Lake. Evocative of 1920s seaside resorts, this venue is as timeless as it is romantic. If you're looking for a classically elegant venue, look no further than the Wedding Gazebo at Disney's Yacht Club Resort, where you can exchange vows surrounded by blooming roses and loved ones on a perfectly manicured lawn. Secluded in an oasis of towering palms and lush greenery, this venue is the perfect backdrop for those couples looking for a tropical getaway. Surrounded by the spirit of the South Pacific, you and your guests will be dazzled by the views overlooking the Seven Seas Lagoon.